Obviously I am missing something. I'm the first to admit that sometimes I just don't get it, so perhaps some of you can help me out. I want to get it, I want to understand, but I am having a hard time understanding all the buzz around Slideshare. Slideshare, according to their website, "is a free service for sharing presentations and slideshows." Sounds promising, but the only problem with this service today is that you can not actually share a presentation. What they mean — and what they should say — is that you can share slides generated in PowerPoint/OpenOffice. The site is appropriately named, however, because you can indeed share basic slides (sans animation, etc.). They were smart not to call it "presentationshare" because presentations are not yet something you can see on this site. However, it is early days so perhaps this will turn into something quite useful in future, but for now this is a real head scratcher for me. I think my designer friend said it best when she gave me her reaction after spending time using the site and looking at the user content: "They only post slides, no Voice Over, so it un-does the entire crusade we're on regarding Zen-like presentation. It goes against the grain of how I think presentations are to be delivered." Is all the buzz just the result of getting mentioned on TechCrunch and having somebody say you're the YouTube of something, or is there something really powerful there that's going to actually help people communicate more effectively? Slideshare has a solid base of user activity. Judging from how people are talking about Slideshare and presentations, many people apparently still believe that slides *are* the presentation, or at least "close enough." The idea that PowerPoint slides can stand on their own and communicate a clear message is widely accepted it seems. 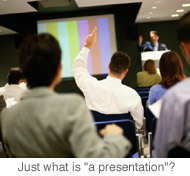 Many users are using the term "PowerPoint" or "Slides" as if they were the same thing as a presentation. So, if you want to share a great presentation you made last week, will uploading the slides used in the talk to Slideshare really help you make an impact? Perhaps, but the problem is, if your visuals were any good for the live talk they probably won't do much good by themselves, and in fact they may obfuscate rather than clarify your story without your own verbal (and nonverbal) input. The site has some potential, but for now at least this service is perpetuating the presentation-as-slideument problem. How much can you really glean from presentation visuals? Slides on their own often tell us little in terms of the actual presentation content or how well the material was presented. For example, here is a deck (below) that I uploaded on my Slideshare account from Swiss designer and conceptual artist Markuz Wernli Saito's presentation last month. Just by looking at the slides, which you may find quite cluttered and unconventional, you could surmise that the live talk was not so great. But you'd be wrong. Markuz's talk was one of the best presentations I'd ever seen; it reminded me of something Dana Atchley used to do. The slides served more as a backdrop to his great narrative. Of course, he also used a lot of video along with his compelling storytelling ability, none of which you can get from just the slides alone. Don't get me wrong, there are some cool features in Slideshare. 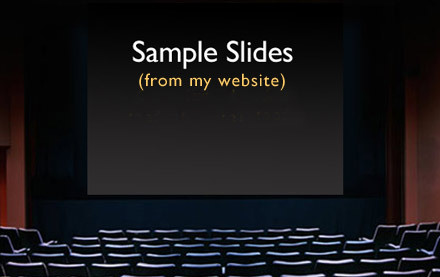 SlideShare does indeed make it easy to upload PowerPoint slides and it is quite cool that you can embed clickable slides into your blog or view them in good quality on a large screen. But without the possibility to include audio (or video and animation) with slides I just do not see what all the excitement is about (yet). Now if Slideshare can make it easy for me to do something like this Flash presentation by Lawrence Lessig, then they are on to something. Nothing on Slideshare comes close to communicating a message as well as Lessig's Flash presentation below. Here's another presentation by Lawrence Lessig on Google Book Search given in classic Lessig style but this time uploaded to YouTube. Everyone agrees that it is often best to see a presentation live if we can, but what if we can not? What does the future of presentations and presentation design look like? No one knows presentation design and delivery better that the folks at Duarte Design. Here's what Nancy Duarte said recently about the future of presentations in general. 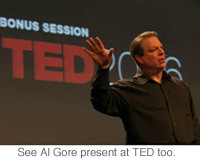 "We’re seeing much higher demand for presentations to be extended beyond the ballroom. Requests for media-rich presentations deployed on the web are increasing exponentially. Options to have slides accompanied with video, presenters filmed on chroma interacting with their slides (a la Mary Poppins), rich-content that’s navigable, video podcasts and sales tools where star presenters walk through how to speak to a file are all becoming standard. Bandwidth is pervasive, digital natives are accustomed to viewing content on the web and virtual tradeshows are growing in popularity." Checkout this example below from MediaStorm.org. Sure, this is not easy to put together, but for the viewer this it is a million times (perhaps I exaggerate?) more compelling than an online PowerPoint deck. The CEO of Slideshare Rashmi Sinha wrote a very good article on her blog recently entitled The social life of PowerPoint where she provides a bit of background on her thinking with regards to Slideshare. Quoting Nina Wakeford, Dr. Sinha reminds us that presentations are "...actually much more about generating and sustaining engagement" than just getting people to focus on slides. She hits the nail on the head when she says a presentation (she calls it a "PowerPoint event") "...constitutes the speaker, the slides, audience present (and connected through audio conferencing), and any technological infrastructure. It occurs in a social context allowing for feedback, annotations, and comments from others." Dr. Sinha then asks the question "What should the social space for slide sharing look like?" This to me seems like the wrong question, however. Once again the focus is back on the PowerPoint slides. Perhaps the question should be "What should the social space for presentation sharing look like?" Slides embedded in a blog post may indeed have more supportive context that slides just passed along on their own, but I am looking for something more than just slides. Document (n.) Something written or printed that furnishes conclusive information or evidence... (v.t.) To support by conclusive information or evidence...(emphasis mine). Sure, definitions change and evolve, but should not a handout or other documents related to your live talk be able to stand alone with sufficient support? This can be difficult to provide clearly in a PowerPoint deck that is viewed without your own narrative. Slides were meant to provide a supportive role to the presenter, not the other way around. Most of the content now on Slideshare gives you "the gist" of the talk, but not much more (but perhaps that's the point). Even the best click-through-my-deck experience would hardly compare to the actual presentation. What we need is the whole enchilada — we need to see and hear the person speaking in addition to seeing the presentation visuals. If that's not possible then a slideshow of sorts with narration and appropriate animation may work pretty well a la Lessig's Free Culture presentation. But clicking silently through slides while attempting to glean the message is not my idea of fun (or learning). In fact I hate it. If you're going to ask me to do all this reading of bullets, etc., why not just present the material in a proper downloadable document or in an easy to read online format with well-written text and embedded images, even videos? Is it a document or a presentation? If it is a presentation then I'd like to exercise my auditory channel as well as my visual channel. And squinting at 9pt type in the "Slide Transcript" window is not my idea of using my visual channel. (See The Cognitive Load of PowerPoint: Q&A with Richard E. Mayer by Cliff Atkinson for more on what makes for an effective presentation). If I can't be there live, then I would would much rather see an on-line video of the presentation shot in such a way that I can see both the presenter and the visuals. TED does a great job of this (the three camera angles help a lot). Would you rather TED provide slides that the presenters used or would you rather kick back and watch and listen to these folks tell their stories and make their points. Sure, for those who see the video or the live talk access to their visuals may have some utility as they can remind the viewer again of the key points. But if we were not there and have no access to a video of the talk, surely a more detailed document with good graphic support would be more desirable. Below is one of my favorite TED presentations, this one by Sir Ken Robinson speaking on creativity, education, etc. (no slides were needed). I just love this 20-minute talk. Who knows what the future will look like? Again, it's early days so Slideshare may turnout to be a very useful service. I can already imagine designers, photographers, etc. using it today to show samples of their work. For this the embedded slides work well. For example, a couple of years ago I made this very "web 1.0" clickable slideshow just to provide a taste of my seminars. Today I could use Slideshare for that and it would be a lot easier. Much of the problem with Slideshare may simply be similar to the problems with PowerPoint (or Keynote). That is, it's not to tool so much as the inappropriate way it's used. I wish the folks at Slideshare well. If you have any examples of good implementations of their service please share those urls. I'd love to see the cool technology behind this service used in great ways. It's hard to find any slide decks that can stand alone, but this one by John Moore is not bad. Of course, with John's narration I'm sure it's much better. Garr, thanks for the great post. Right to the point. Actually, I had the same hard time understanding the usefulness of Slideshare. At the begining, I thought it was going to be the YouTube of presentations. After a month or so using it myself (see below), I think it is going to be a Flickr for pictures slideshows. Not presentations per se, as we understand it in business. Just photos sharing stuff. I put a couple of presentations on Slideshare over the last two weeks, to investigate its potential - maybe someone will drop me an email, right ? As of today, I get this one : http://slideshare.net/mduchesn/wahoomcom-soon-to-a-computer-near-you/ as a hit (ranked #41 of the month, as of this morning). I guess that the nice photos (from SXC, by the way) make it attractive for the people watching Slideshare. Interesting : this file being a simple export from Keynote to PPT, the fonts are crap (I didn't take attention). No comment on that issue at all, which means IMHO that people are just looking for great photos, nothing else. Another fact in this direction : I posted a presentation aimed at a new technology introduction for consumers (see here : http://slideshare.net/mduchesn/fibertothehome-powerline-technology/)- Slideshare users are right in its target zone, presentation that I created with Comic Life - so, it's not a typical usual Powerpoint slideshow. I thought it would raise some interest on Slideshare. As of today : no comment at all, no call, nothing. Last facts : I modified the first presentation (the #41 of the month), to display the right fonts. Very low response. I also posted a pure diaporama, featuring some photos of San Francisco : very low response too. 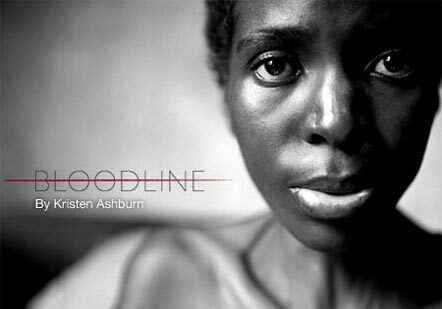 Hence my conclusion : Slideshare is a website aimed at people looking for great/unusual photos. It's not about Powerpoint for presentations, it's about Powerpoint as an automated slideshow instrument ! As long as people see slides as the end, and not the means to the end (or rather the AID to the means to the end), then we'll probably not see a wholesale shift in how and why people use slideware (or services like Slideshare). Perhaps as rich-media applications become more mainstream, we might see some improvements in people focusing on the story, not the slides. But in our time-crunched world, it will always be faster to just dump your thoughts onto some slides (at least for the majority of people). Garr ... first up, thanks for the link love to my TRIBAL KNOWLEDGE slide show. I actually posted that prezo as a way to bypass sending a chunky email file so that folks could follow-along to a teleconference I did recently. So I agree that narration is critical when sharing PowerPoint prezos. But, used as a virtual leave-behind ... posting prezos to SlideShare works great.